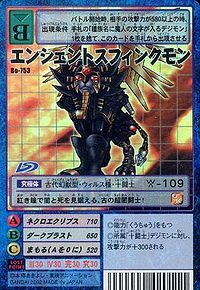 Possessing the attribute of "Darkness", it is one of the legendary Ten Warriors Digimon that saved the ancient Digital World. 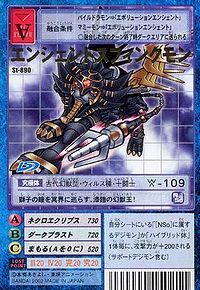 An Ultimate who existed only in the distant past, it is set at the opposite extreme to Ancient Garurumon as a being born from darkness. It rules over the destruction and annihilation of all existing or living things, and is feared as the "Deadly Dark Beast". 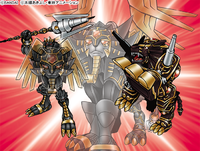 Ancient Sphinxmon's abilities were later passed on to the "Mythical Beast" and "Demon Beast Digimon". Its Special Moves are a laser beam fired with a roar (Dark Blast), and the ultimate annihilation technique which completely envelops the opponent in the darkness of death (Necro Eclipse). Title: 「伝説の闇の闘士」 — "Legendary Warrior of Darkness"
「死を招く闇の獣」 — "Deadly Dark Beast"
| Sphinx (Σφιγξ) (「スフィンクス」 Sufinkusu) is an Egyptian mythical beast. An ultimate annihilation technique that envelops the enemy in the darkness of death. A laser beam fired with a roar. 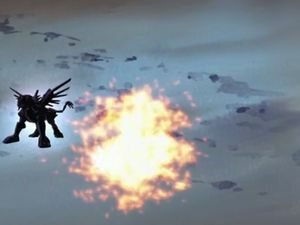 Silhouette of Ancient Sphinxmon from Digimon Frontier. 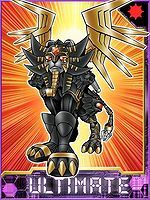 Ancient Sphinxmon was one of the Legendary Warrior Ten whose spirit was reborn in the Human Spirit of Darkness to create Löwemon and the Beast Spirit of Darkness to create Kaiser Leomon. Ancient Sphinxmon appears very briefly whenever Kouichi uses the Ancient Spirit Evolution attack. Can evolve from Skull Baluchimon with the Spirit of Darkness. 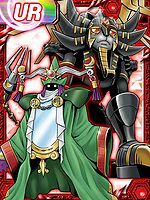 Can be created by combining Nefertimon, Skull Baluchimon, Scorpiomon, and Digitamamon. 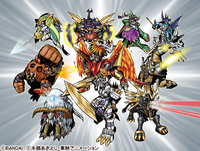 Can DigiXros with Ancient Greymon, Ancient Garurumon, Ancient Beatmon and Ancient Troiamon to create Susanoomon. 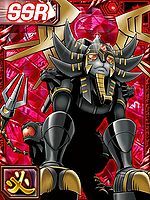 Ancient Sphinxmon can only be obtained as a collectible card. Its card is part of the Warrior Ten (十闘士 Juttoushi) set. Ancient Sphinxmon is available as a Digimon Medal. Ancient Spinxmon is available as a Digimon Medal. 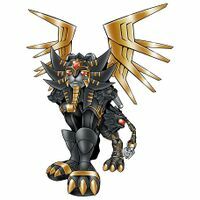 It patrols the underworld with the eyes of a lion, an mythical beast king clad in jet-black armor! This ancient super warrior of darkness gazes at death and darkness with its crimson eyes! 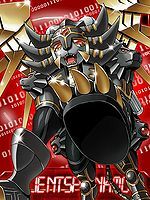 ↑ 6.0 6.1 Digimon Frontier: "Go Beyond Time! The Beginning of a New Legend"